Home/Knowledge Base/CMS/How to transfer WordPress site to another? How to transfer WordPress site to another? If you have a live WordPress website and want to use the same content but with another URL without doing the redirection, you may do the cloning process. You may generate the website files. However, it is necessary to untar the gzip file so you can locate the file directory of your WordPress site. and download the newest backup available. Zip the file and download it via the File Manager. Step 2. Export the WordPress database. This can be done via phpMyAdmin in the cPanel. Make sure that the domain name is pointing to the correct directory. Upload the website files. If you are uploading a zip file, make sure to unzip it. Import the database (the SQL backup file from the current website). Change the database configuration to the ones you have newly created. Update the site URL and home URL to the new website URL. (Example: From http://oldwordpresswebsite.com/ to http://newwordpresswebsite.com/). Step 1.Click on phpMyAdmin under Databases panel. Step 2. 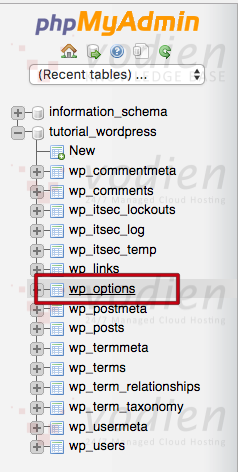 Select the database of your new WordPress site and click wp_options table. Step 3. Edit the siteurl and home. Step 4. Enter the new WordPress URL and click Go button to save the changes. You may now access the website. In case you want to have different login credentials for the dashboard, you may edit it through the dashboard itself or through the phpMyAdmin. There are two types of transferring to Vodien. You may transfer the domain name and the hosting of website or just the hosting of the website and keep your domain registration to your current domain registrar. Check out the two options and be guided accordingly. You may also contact our Migration Team to do the website transfer for you. Please read the information from our switching to Vodien article. 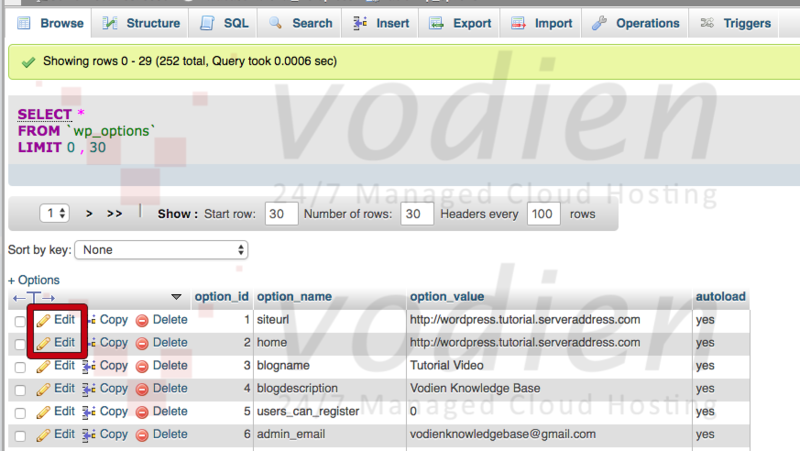 Make sure that your domain name is added in your cPanel and is hosted with Vodien’s servers. Please also check the directory where the domain name is pointing. Upload all of your files to the directory where the domain name is pointed using FTP.